"The M15 and Washington's Puget Sound are a great fit; Often times in the summer months this large expanse of water is in many ways just a large lake... without much wind. Since the M15 does not take a great deal of wind to power her, the fit is excellent, just watch for the tidal rips and current movements. In a blow, set the correct sail. A double reefed main and storm jib may be required when the weather comes on hard". If you have a strong backpacking history the M15 is an easy fit for week long cruising. you have essentially a fiberglass tent ... a really nice one with lots of storage space and a good sized bed. I use the Honda 2hp outboard and have been quite happy. The motor easily moves the M15 at 4 knots. When I motor, I throttle up 1/2 to 3/4 of engine speed and get an hour or more per tank of fuel. During a recent (2007) Montgomery Group sail, motor time was 12 hours and 50 minutes out of a total of 33 hours and 10 minutes of boat travel. Total sailing distance was 102 Nautical Miles (including tacks). I left the dock with 3 1/2 gallons of fuel and returned a week later with better than 1 1/2 gallons, using about 2 gallons during the cruise". For more information about SCRED see - www.freewebs.m15-named-scred.com. NOTE: in 2009 SCRED was sold. 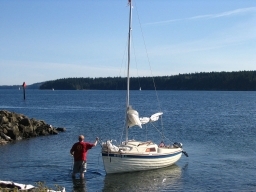 Her new owners are in Friday Harbor, San Juan Island, Washington State.